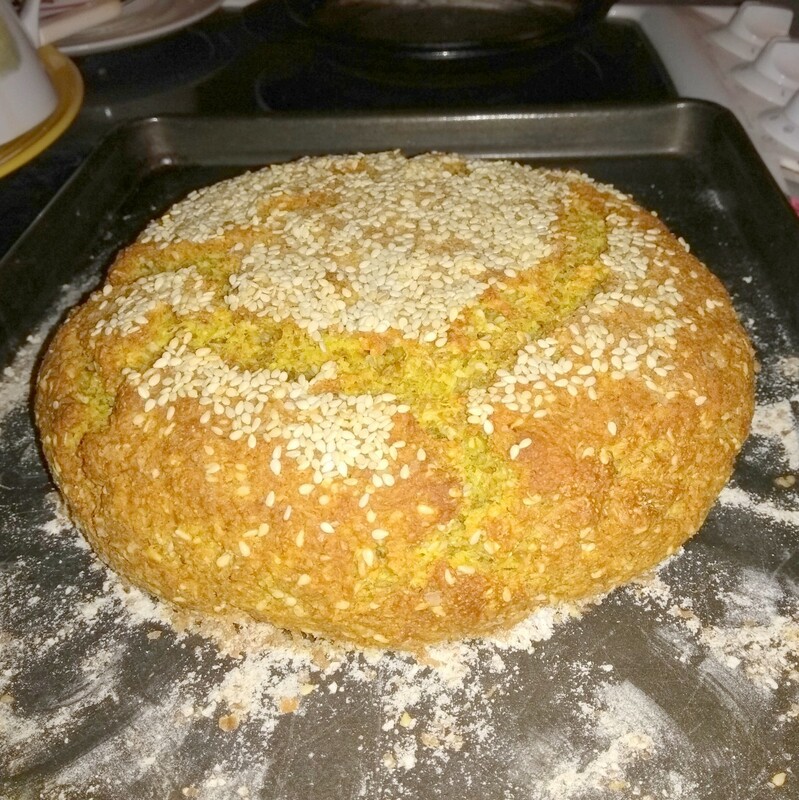 I have also included a video of my 84-year-old mother making the bread. Preheat the oven to 425 Fahrenheit or gas mark nine. Lightly grease your chosen tin. Into a large bowl sieve the flour, and then add the salt and baking soda. Mix these ingredients together with your fingers, lifting slightly in the air as you do so. This gives the best result because it allows the air to pass through the mixture naturally. Put in the margarine and mix with your fingers until the mixture is crumbly. 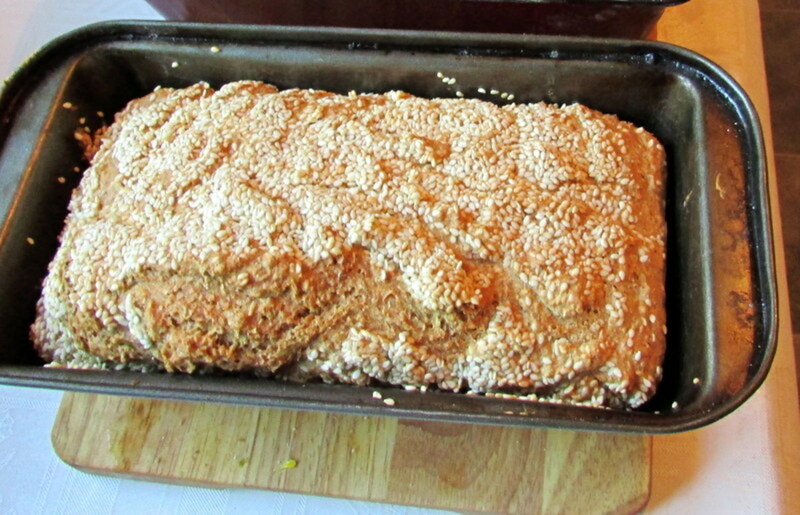 Do not use a mixer for this process because you will find your soda bread will taste heavy. This is because the air has not had enough time to mix in with the ingredients. Make a hole in the centre of the mixture and add half the amount of buttermilk. Mix in with a wooden spoon. Gradually add in the remainder of the milk. Once the milk has been blended with the dry ingredients it is time to finish off the mixing with your hands. You are aiming to achieve a light, soft dough, sticky but not too wet. On a wooden board sprinkle a generous amount of flour. Sprinkle a little flour onto the top of your mixture in the basin to allow for easy removal. Tip out the finished mixture on to the board. You will have to lightly knead the dough for about one minute. 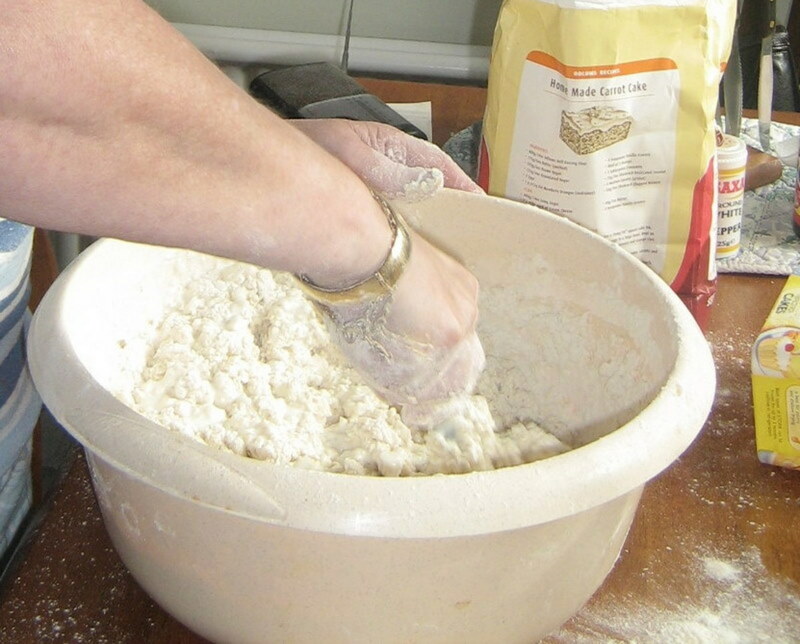 Cover your hands with flour, as this helps with the process. 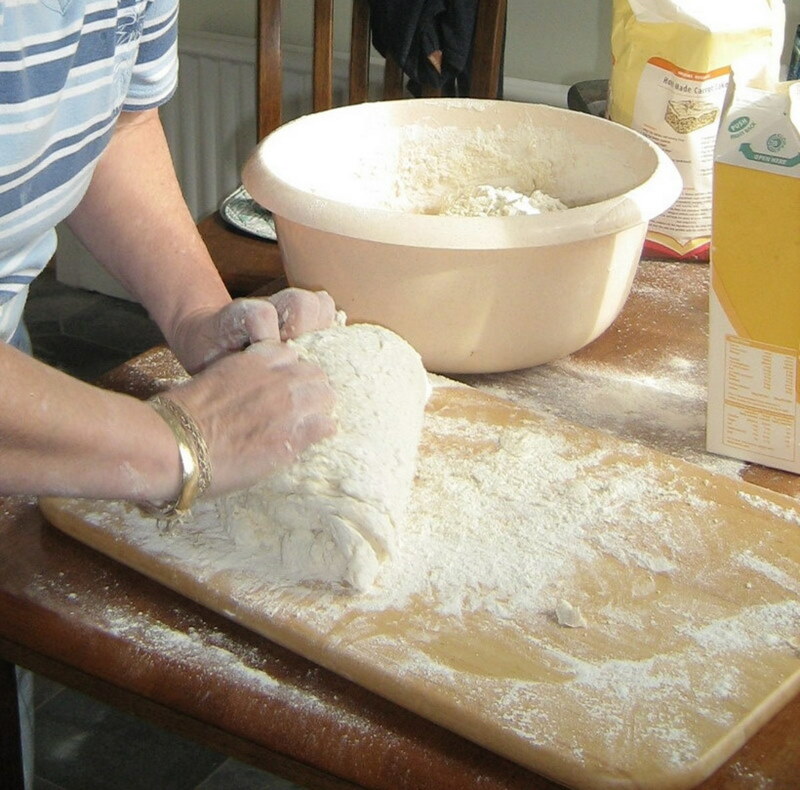 If the dough gets too sticky, add more flour to the mixture. Once this process is finished, add a sprinkling of flour on top of the dough. Put into your tin. Most people like to use the traditional round shape. I have been taught by my mother to use an oblong shape tin, so this method is what I use. The last important step before baking the bread is the cross. Using a large knife, cut down and across to make a deep cut in the dough. When the bread is cooked, this cross will have separated the bread so that it is very easy to break the bread in to four quarters, making it easier to cut into slices and for storage and freezing. Bake in the preheated oven at 425 degrees Fahrenheit for fifteen minutes. Turn down the oven to 400 degrees Fahrenheit for the remaining thirty minutes. Have a clean wet tea cloth ready for when you are about to remove the soda bread from the oven. If you bake this bread often, it is advisable to have a plastic bowl and a few tea towels exclusively for this purpose. It should look lightly brown on top. Before removing it from the oven you can test it by inserting a large knife into the centre. If it comes out dry then it is cooked. Bring the tin over to the wet tea towel and tip out on to it. If this is your first time baking soda bread and you are not too sure if it is cooked then once it is removed from the baking tin you can tap the underneath lightly, if it sounds hollow then it is ready. This should also be lightly brown in colour and firm. As quickly as you can wrap the wet tea towel around the hot soda bread and leave standing up against the wall or on a wire tray until cool. This will trap the flavour in and keep the bread soft while it cools. 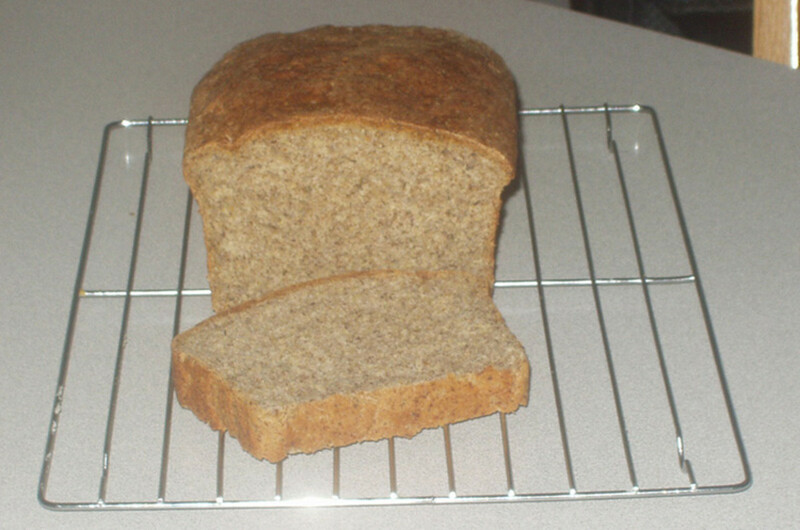 Substitute twelve ounces of brown flour with the same amount of white flour. Prepare and bake as above. Preheat the oven to 425 Fahrenheit /Gas Mark 9. Lightly grease your chosen tin. Into a large bowl sieve the flour, and then add the salt, baking soda, sugar and sultanas. Mix these ingredients together with your fingers, lifting slightly in the air. This gives the best result because it allows the air to pass through the mixture naturally. Put in the margarine and mix with your fingers until the mixture is crumbly. Add the egg and half the buttermilk into a small dish and whisk gently with a fork. Make a hole in the centre of the mixture and add this to it. Mix in with a wooden spoon. Gradually add in the remainder of the buttermilk. On a wooden board sprinkle a generous amount of flour. Sprinkle a little flour onto the top of your mixture in the basin to allow for easy removal. Tip out the finished mixture on to the board. You will have to lightly knead the dough for about one minute. Cover your hands with flour as this helps with the process. If the dough gets too sticky add more flour to the mixture. Once this process is finished add a sprinkling of flour on top of the dough. Knead until you have a nice shaped ball. 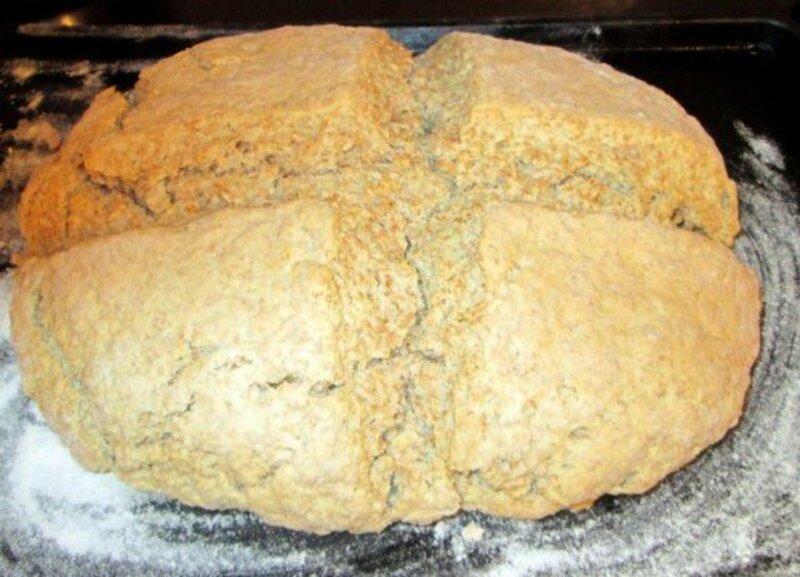 The last important step before baking the Irish Soda Bread is the cross. Using a large knife cut down and across to make a deep cut in the dough. 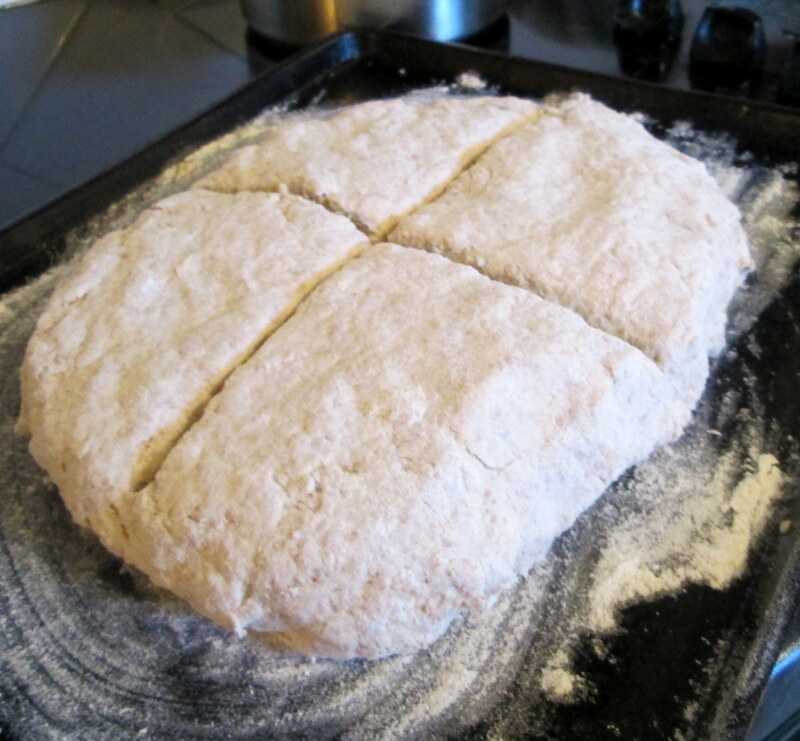 When the bread is cooked this cross will have separated the bread so that it is very easy to break the soda bread in to four quarters. Have a clean wet tea cloth ready for when you are about to remove the loaf from the oven. Check on the loaf to see if it is cooked. It should look lightly brown on top. Before removing it from the oven you can test it by inserting a large knife into the centre. If it comes out dry then it is cooked. Bring the tin over to the wet tea towel and tip out on to it. Once removed from the oven tap the underneath lightly, if it sounds hollow then it is ready. This should also be lightly brown in colour and firm. 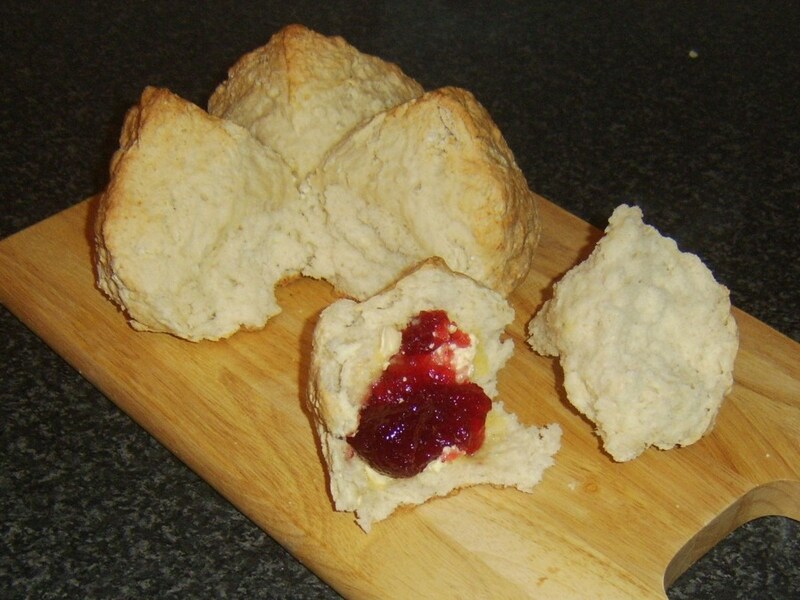 The sultana soda bread can be covered with butter and jam for a delicious snack. By pouring hot custard over the sultana bread you have a very quick and tasty desert. For the best flavour and taste it is always eaten the same day. Once it has cooled down enough to cut, then slice it up and spread on butter. You can also add jam or honey. Another very popular use in Ireland for this bread is at breakfast time. After frying an egg, rasher, tomatoes and sausage on the pan add a little bit of oil to the pan and cook for about 15 seconds, until the bread is lightly brown. This soaks up all the flavours of the rashers, tomatoes and sausages. This bread freezes very well, so if it is not going to be eaten that day prepare it for the freezer. It is always best to do this as soon as the bread is cool enough because the freshness is then frozen. You can either wrap a quarter piece of the loaf in a freezer bag and freeze whole or you can cut up in slices and wrap two slices in each piece of cling film. Once removed from the freezer and put in the microwave to defrost it is as fresh as if it has just come out of the oven. I have not eaten soda bread for a long time. I have to bake this bread again. I was wondering is it possible to substitute the butter milk with normal milk for the soda bread ? I think I will stop going through your hubs for today, they are very tempting. You do such a wonderful job with everything from instructions to pictures! I have bookmarked a number of your recipes. 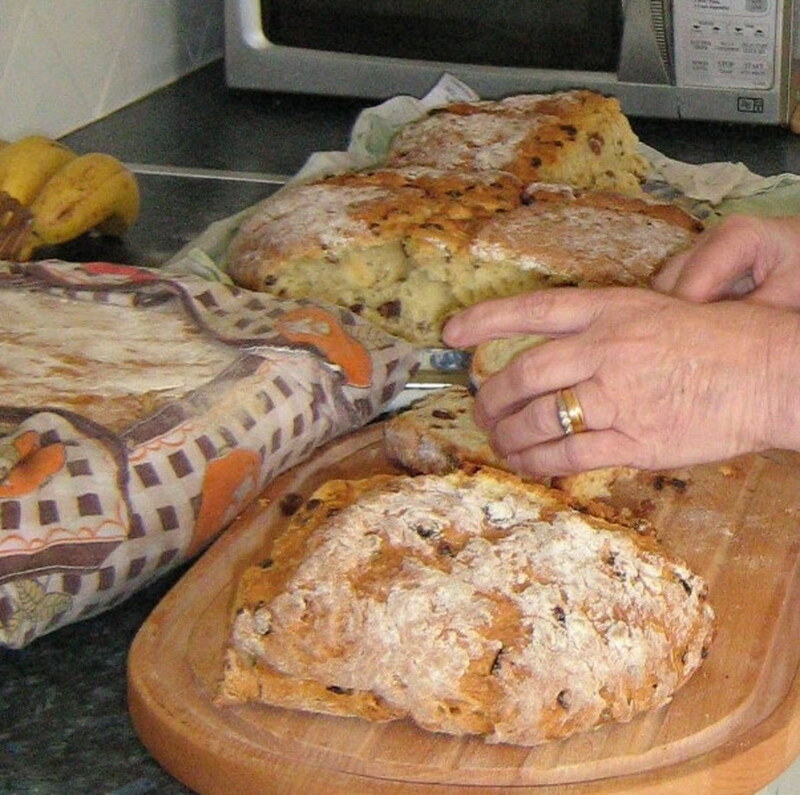 My mothers recipe for Irish Soda Bread really is easy to make. She makes a few of each and then freezes it so her and dad always have some on hand when they want it. I think I'll have to try this! I've never made bread before, but it looks so good, I at least have to try! Voted up, useful, and awesome! Thanks for SHARING! SOCIALLY SHARED! Wow, what a great hub! So useful too! beautifully presented and clear... thank you for sharing this! I love Irish Soda bread. It is very delicious especially when they are fresh.Thanks for sharing. Bookmark for later use. 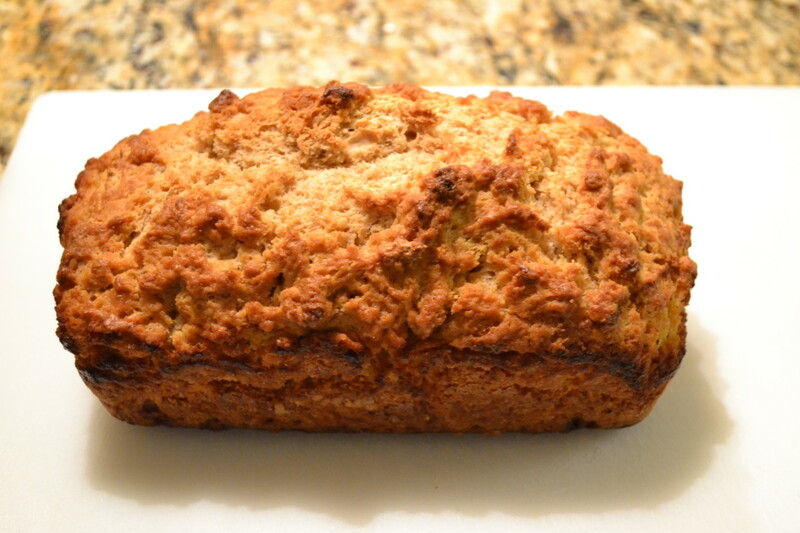 I love irish soda bread! That might be delicious, viking305. Do you think you made me hungry? - No, I'm starving now! Unique recipe and step by step description! Thumb up! I was glad to see this Hub. I love Irish soda bread, but the only time I get to have any is when St. Patrick's Day is coming, and my local grocery store makes sure to have it (until a couple of days past the 7th). So now I must make soda bread. Thanks. Awesome! I forgot how much I liked Irish Soda Bread with a good cup of tea. 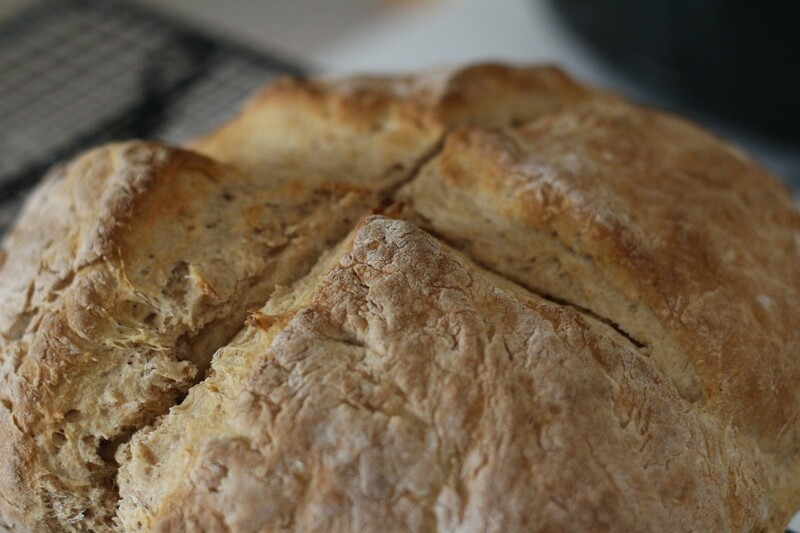 Mmmmm, soda bread, my mother used to make it all the time. My favorite was when it was fryed with the breakfast. I haven't made it for ages but after reading this, I'll be making it soon. 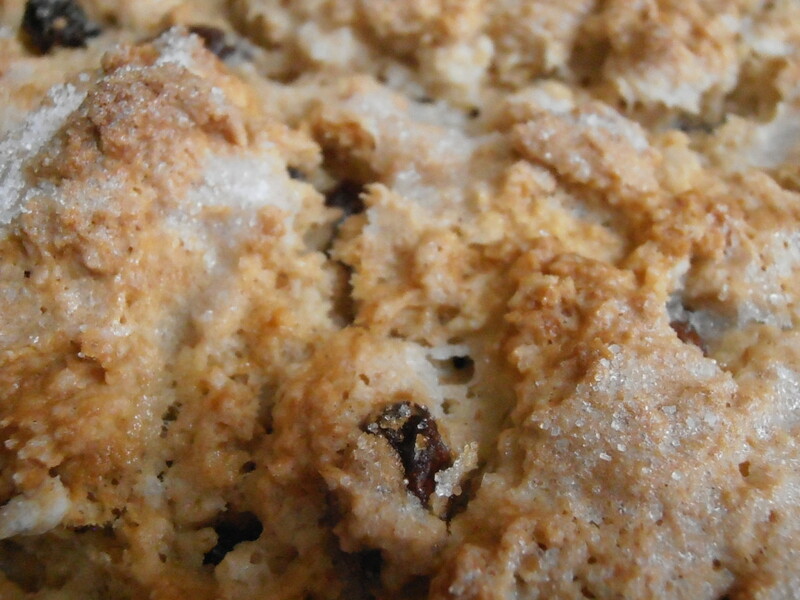 I love the photo of the sultana soda bread. Thank you BjBenson. Christine and Christine 777 for your comments. It is worth giving a try because the soda bread really does taste wonderful And it is a great recipe to share with the children, they can join in and 'help' while having some great fun. I can smell it cooking right now in the oven. I will try this soon. You make it sound easy. Thank you for this gift of love from you.